Vandalism at the airport... yes even at the Frankfurt Airport, one of the biggest and busiest airports in Europe, one can find vandalisms on the walls...well, at least in the toilet cubicles. Like this one that I noticed. I have been going to the same toilet for more than a year now, but I never realized that they were there, because well, I don?t really make a habit of staying inside the cubicles longer than when I need to. I mean, how long does one make a business inside the cubicle? Probably not more than 10 minutes especially on a public one. Well, at least I don?t. And definitely don?t make the habit of checking out the walls on the cubicles as well for news reports or ads like ?looking for a special lady? Call me at 12344-65-44?. I wonder what is so special with her? Anyway, where was I? Ahh yes, the vandalism that I just noticed at the airport, in Hall A level two. **WE saved your asses from Hitler. 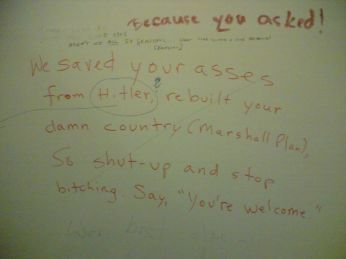 Rebuilt your damn country (marshall Plan) so, shut up and stop bitching.. Say ?You?re Welcome? Somebody wrote the last question in German in very fine point. As if it really matters? Or maybe he/she wanted to know the phone number of the person who wrote the first sentence? An ally perhaps? Hahaha! The pictures are quite bad, I know. Well, as I have said, I don?t like to stay too long inside a public toilet cubicle.